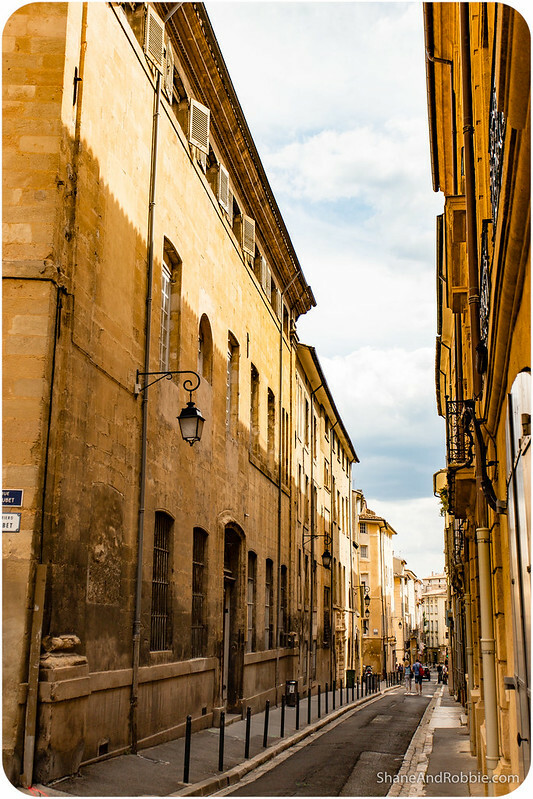 Once the capital of the kingdom of Provence, Aix-en-Provence is today a beautiful city that draws crowds of admirers. 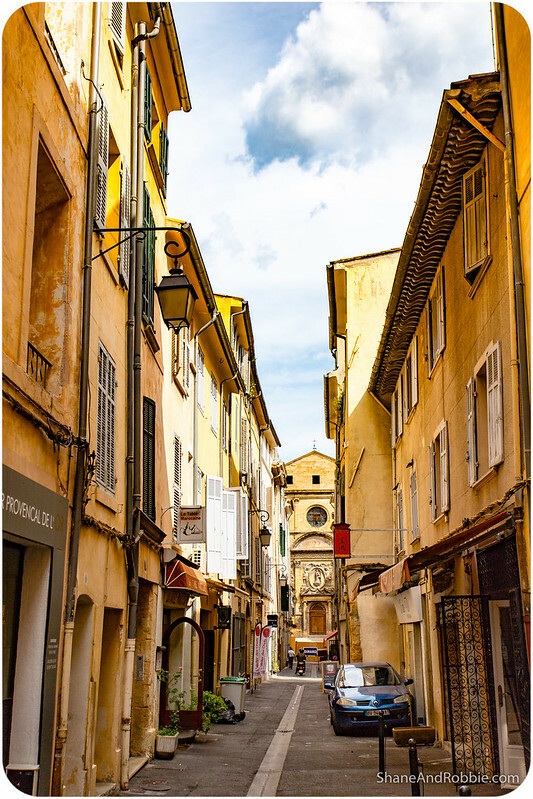 Some come for the warm, dry climate and clean air; others for the golden buildings and narrow cobble-stoned streets of the old town; artists flock here for the clarity of the light and the landscape; foodies come to enjoy the best of Provence’s produce and gastronomic delights; and shopaholics for the many high-end boutiques. Us? 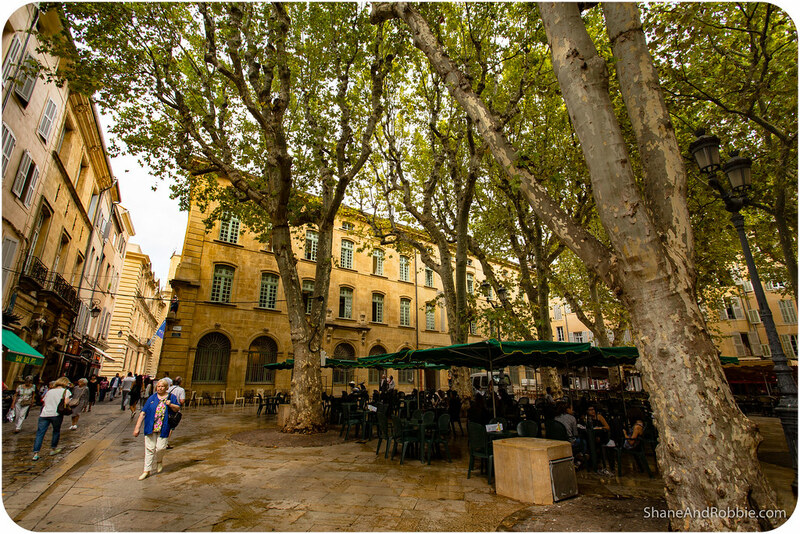 We’re here for a little bit of everything and to enjoy the simple pleasures of life in Aix-en-Provence. 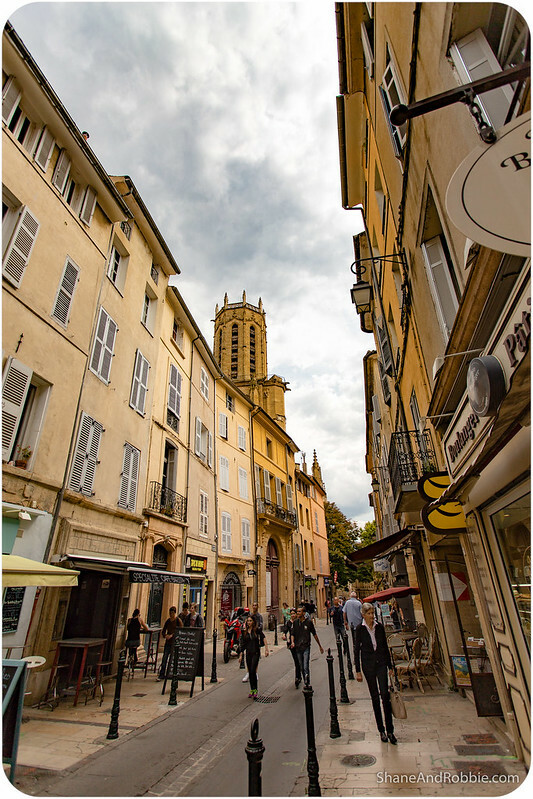 Aix-en-Provence (or simply Aix as the locals call it) is a small, classically Provençal town, famous for being home to Cézanne, for its many fountains, and its attractive cityscape. From what we saw today, walking its streets, it’s a quiet, clean, and comfortable city. 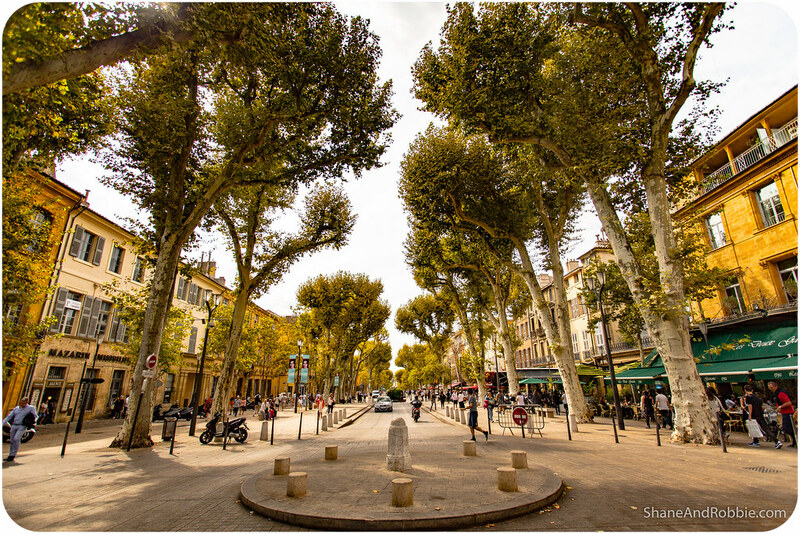 The city centre is mostly pedestrianised, making it easy to explores Aix’s leafy boulevards and public squares lined with beautiful 17th and 18th century mansions. 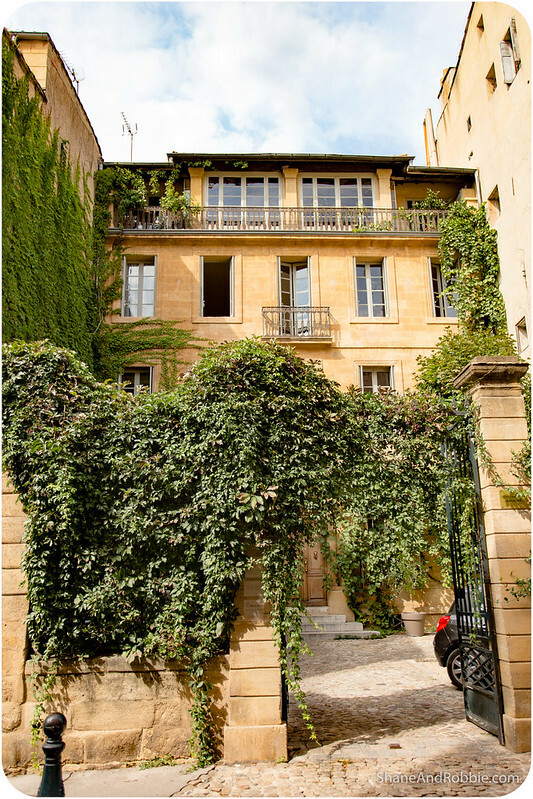 Settled first by the Greeks, then by the Romans, Aix-en-Provence has a reputation for being an expensive, exclusive little town. 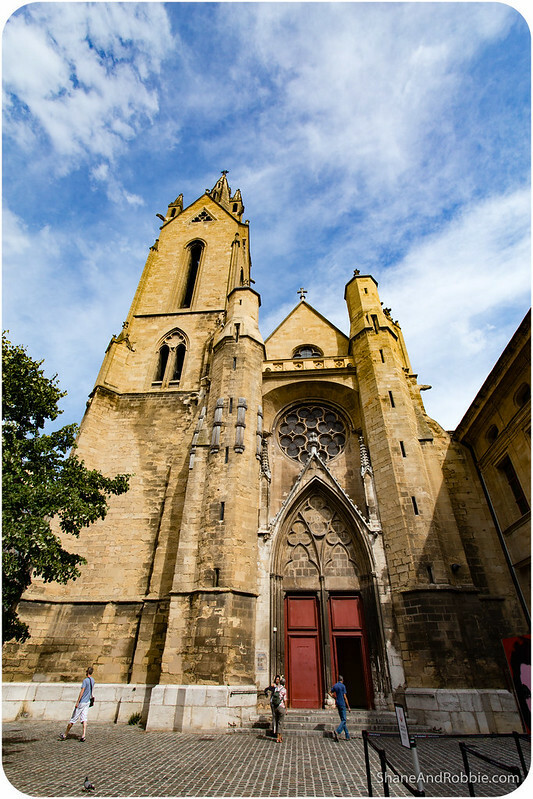 It has always been a rich city, and continues to attract wealthy retirees. We passed through Marseilles* on the way here and the difference between the 2 towns is remarkable – especially considering there’s only 30km distance between them. 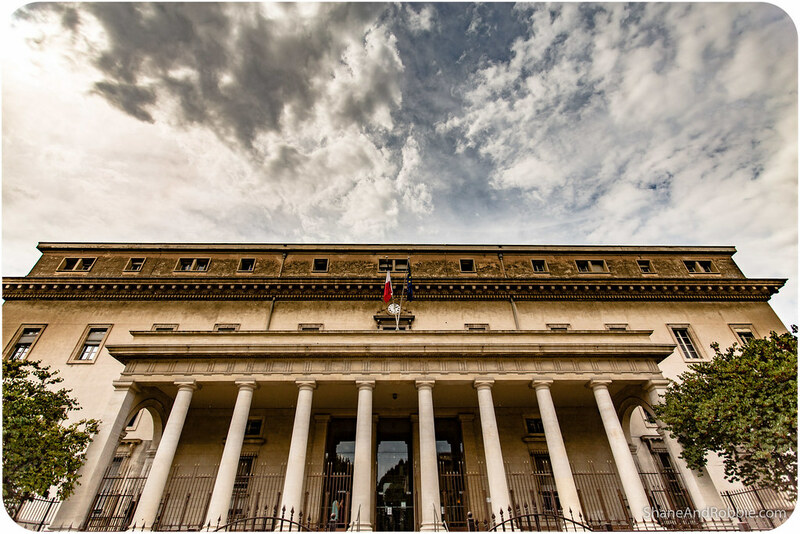 *Marseille is one of the poorest French cities, and one of its most troubled with high crime rates and a shady reputation. 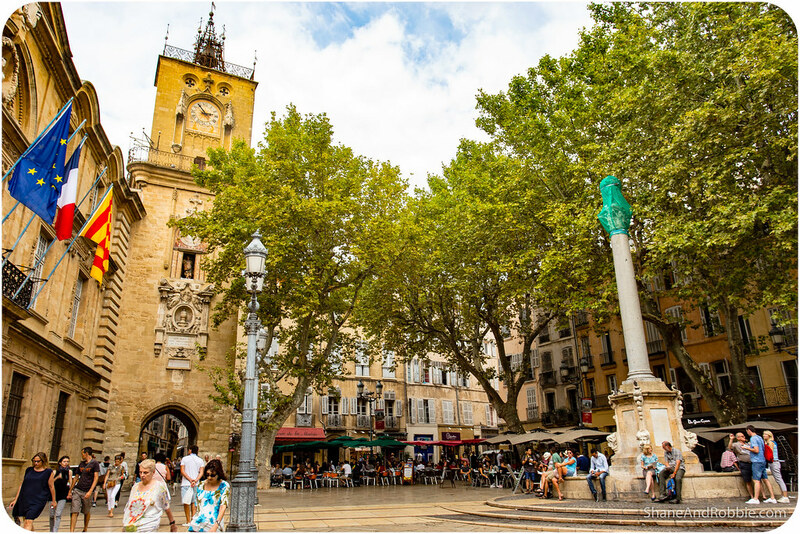 Cours Mirabeau is the centre of the centre, and the heart of Aix. This beautiful tree-lined avenue was where our explorations of town started…, and almost finished. 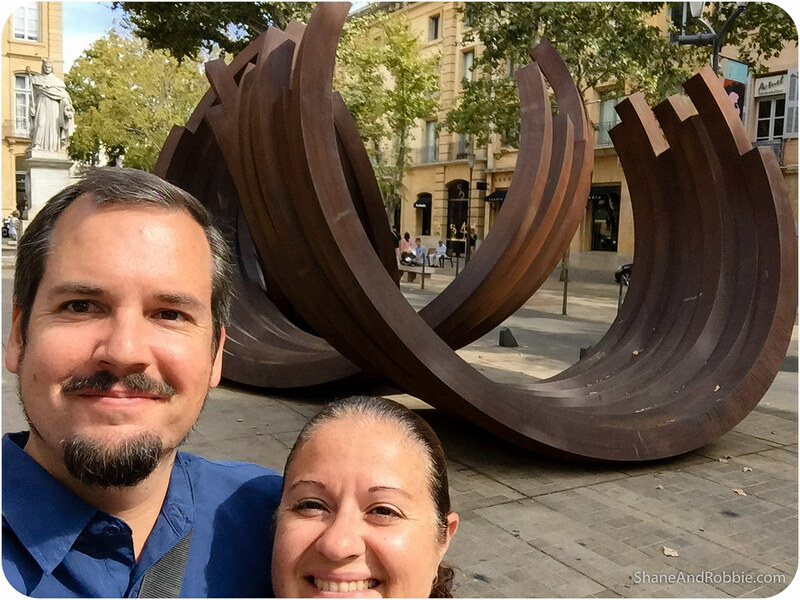 We sat down for lunch at one of the many cafés on Cours Mirabeau at almost stayed there for the afternoon. It was lovely – the air was warm, the sidewalk alive with people, and the atmosphere decadent and relaxed. We did eventually leave our lunch spot behind, however, and set out through the streets of the old town. 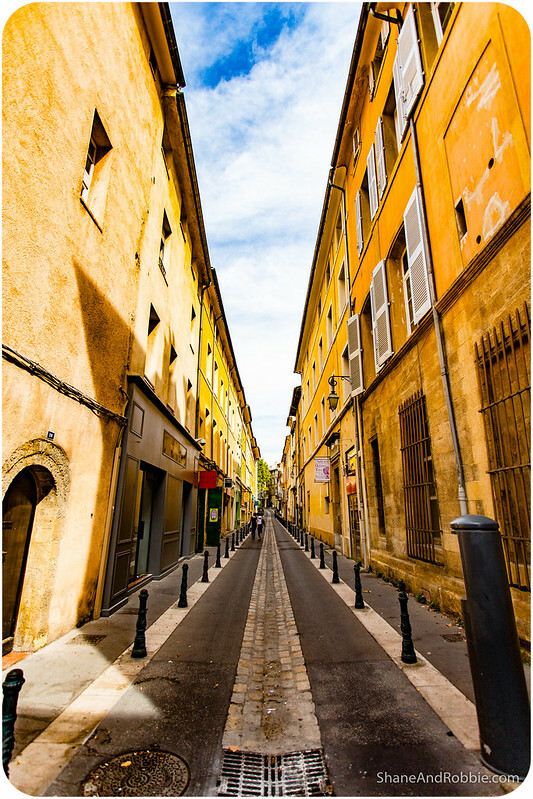 With its narrow, irregular streets and its old mansions dating to the 16th, 17th and 18th centuries, Aix’s vieux ville is just as bit as photogenic as you would expect. 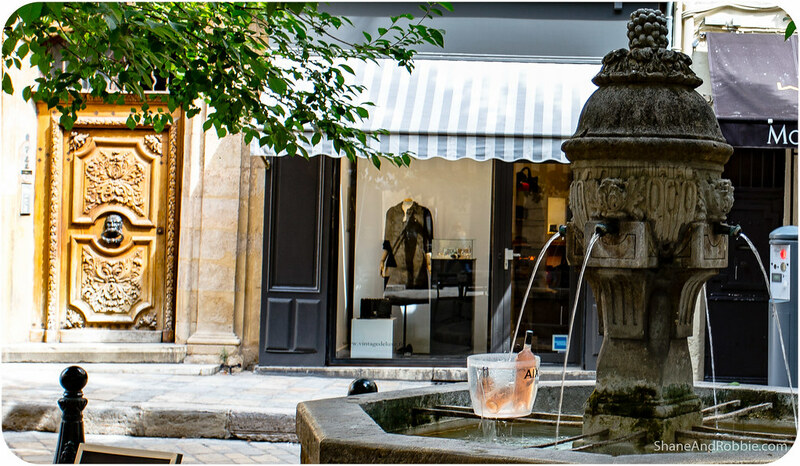 Aix is famous for its fountains. The largest and most famous is La Rotonde, which was bulit in 1860 and has 8 lions, 8 cherubs in the water on swans, and on the top a smaller basin with leopards’ heads. On the very top are three allegorical female statues representing Justice, Agriculture and the Arts. 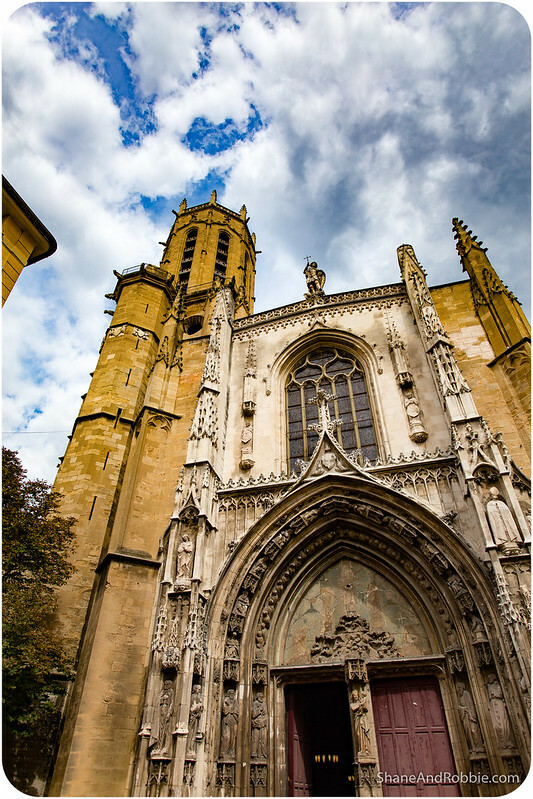 Along with the dozens of fountains sprawled around the city, Aix is known for its architecture. 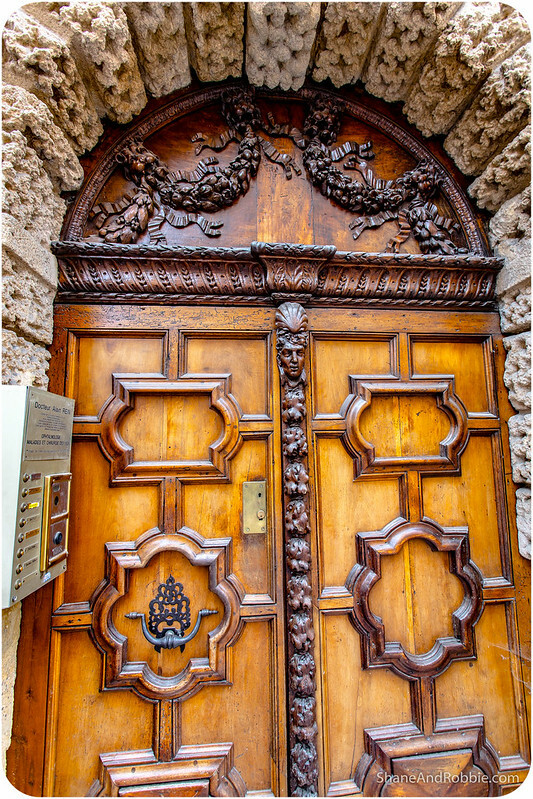 The often intricate doors are a key feature. 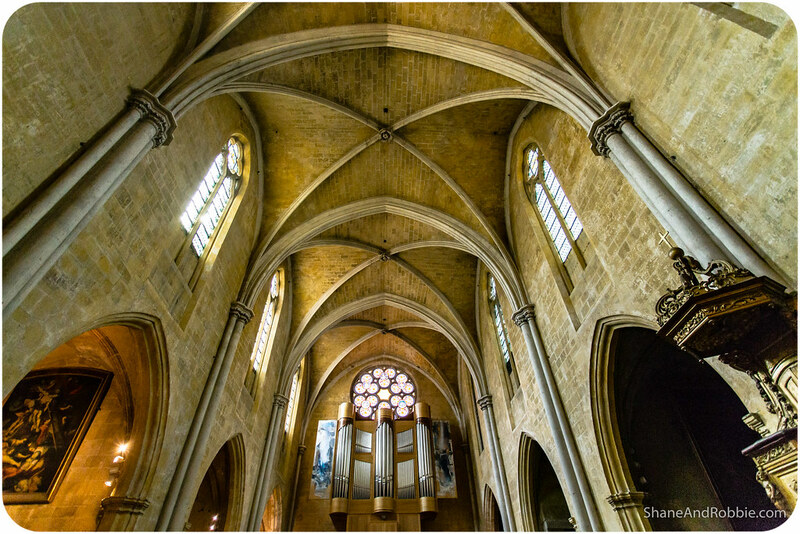 On our travels we passed by the Cathedral of the Holy Saviour (Aix Cathedral), which was built on the site of a former Roman forum; the Palais de Justice, which now occupies the former Palace of the Counts of Provence; and the Hôtel de Ville, a building in the classical style of the middle of the 17th century. 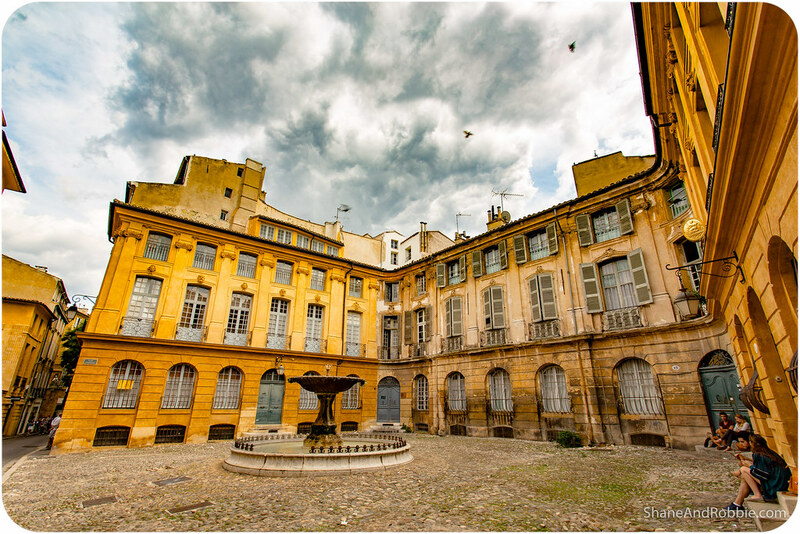 Near l’Hôtel de Ville were the thermal springs that first drew the Romans to Aix and gave it the name Aquae Sextiae. South of the Cours Mirabeau we found the Quartier Mazarin. 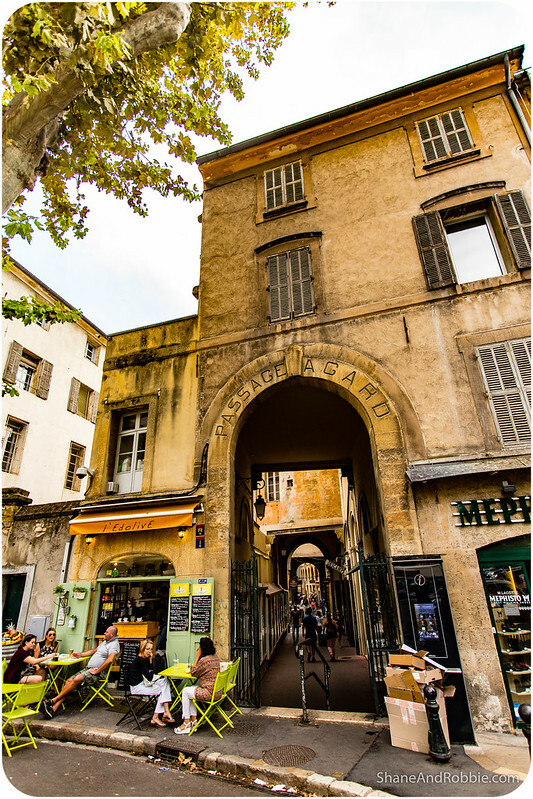 This residential district was constructed for the gentry of Aix in the last half of the 17th century and contains several notable hôtels particuliers. 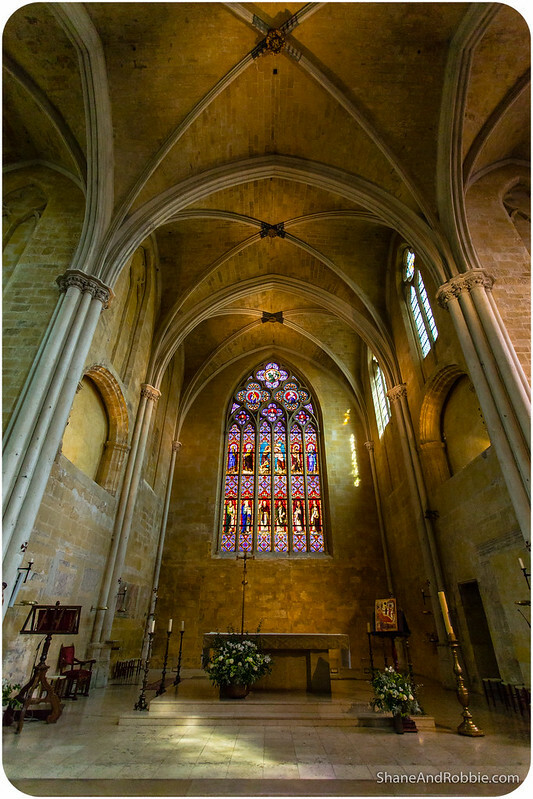 The 13th century church of Saint-Jean-de-Malte is here too, with its simple interior glowing golden in the afternoon sun. 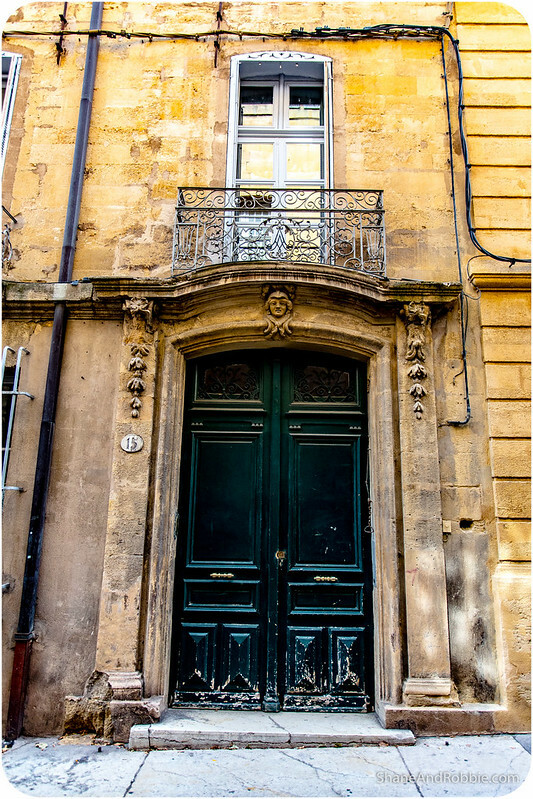 Next to the church of Saint-Jean-de-Malte is the Musée Granet, which contains works by Renoir, Monet, Van Gough, Picasso, and Cezanne. Much to our dismay the museum was closed and will be until later this month due to “unforeseen circumstances”. Such a pity! 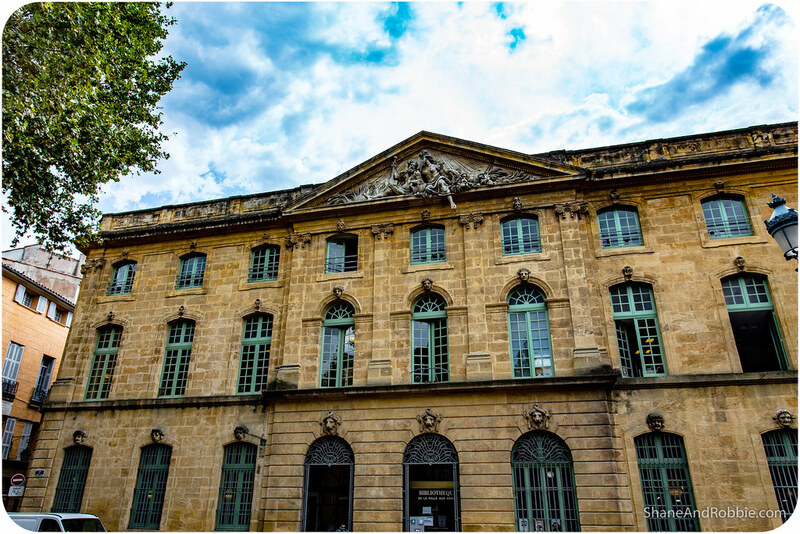 Seeing the museum’s collection of art works was going to be a highlight – especially as many of the paintings housed in the Musée Granet are of Aix and the surrounding region, painted by the artists during their time living in Provence*. Ah well, visiting the museum just gives us an excuse to come back right?! *Artists have been painting in Provence for centuries, drawn by the climate and the clarity of the light. The special quality of the light is partly a result of the prevailing wind hereabouts, which removes dust from the atmosphere, greatly increasing visibility.